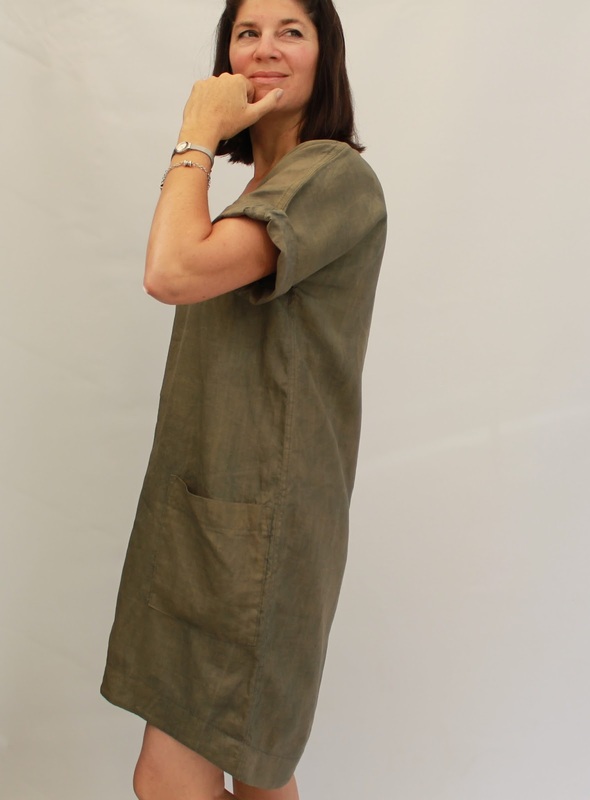 I have had this StyleArc Adeline dress on my mind ever since I saw Lauren's version on Instagram. I delayed buying the pattern while I tried to justify to myself that it was sufficiently different to the Named Inari and Merchant and Mills Camber patterns that I already have. I further tried to justify to myself that I needed yet another pattern to add to my overflowing pattern cabinet. Then came the Black Friday sales and, well, resistance was futile! I made this from khaki linen from my stash. I am trying to use my stash for everything lately as it's getting beyond a joke and taking over the entire house. I think this fabric came from Remida. I constructed the dress with French seams throughout and topstitched them down. I also shortened the dress by about 5cm. I made my usual StyleArc size 10. 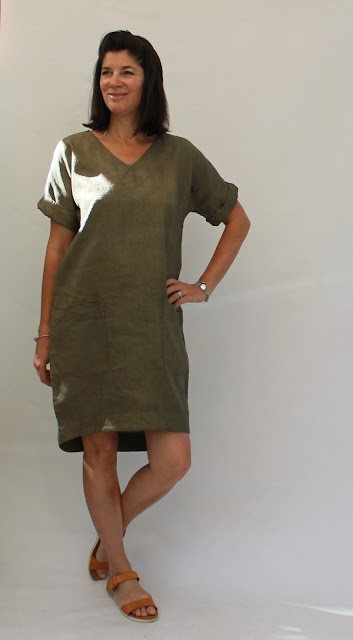 I just love the easy, relaxed style of this dress with the wide neckline facing, deep pockets and slightly hi-low curved hem. The sleeves have a wide hem so they can be turned back without internal seams showing. It's a very well designed pattern. I decided when I had finished the dress that khaki wasn't really my colour, so I dunked the dress in my trusty indigo dye vat. My indigo is fairly pale and didn't do much to the khaki. However, if you look closely, it seems to have dyed some of the fibres more than others resulting in a lovely depth of colour that I'm quite pleased with. I just love this pattern and the dress is very stylish, comfortable and easy to wear, which is pretty much everything I look for in a dress. Well obviously that I should go with my intuition and just buy all the patterns! Ha ha - we have twin dresses! I made an olive green Adeline that is very similar- scheduled to be posted on my blog tonight! 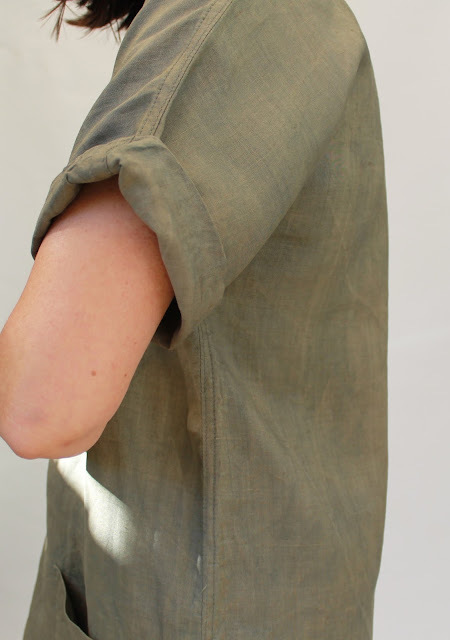 This looks great on you- I love the two toned color you got from the indigo dye! Great minds think alike. It's a fab pattern. Lovely as always Meg, you look great in this style. I am also on a Fabric diet at the moment because it is out of control. I really like the relaxed vibe of this dress. 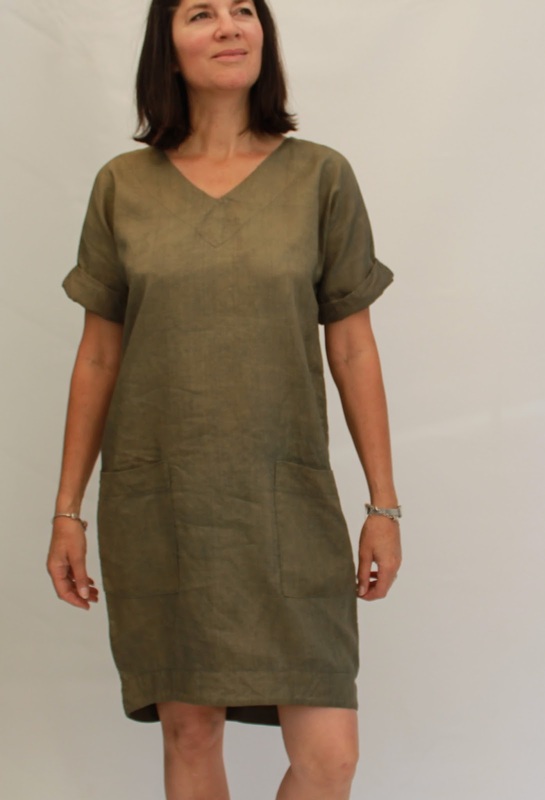 It is the perfect dress for summer and the ritual covering up which comes from living in the Southern Hemisphere. I have some red linen in my stash that would look fantastic in this. I just might have to put in a sneaky order to Stylearc! Yes, that covering up is getting more and more necessary and this is a good way to do it! Yes, this dress is cool, elegant and yet looks totally comfortable. The indigo dip really did add a special dimension - gorgeous! This is a great pattern and I already have fabric ready for my second one. 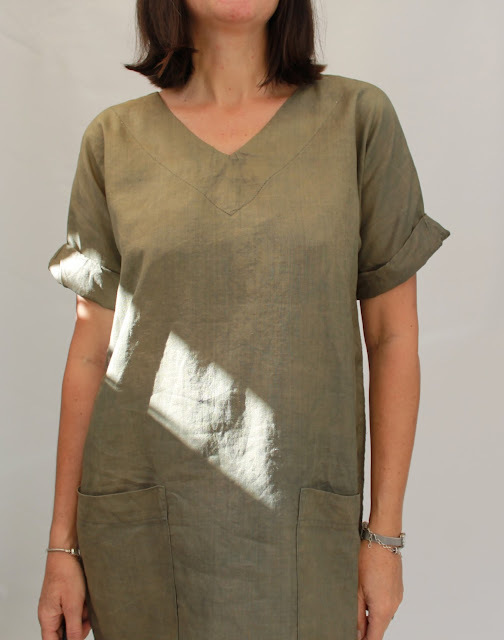 Yours is lovely in linen and the dye gave it an interesting dimension. Shortening it looks great too. Awesome dress! Perfect dress for a hot summer day. Might have to think about adding this one to my list. VERY VERY nice. 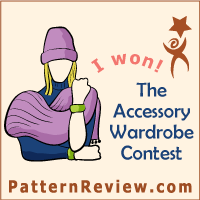 I have a Hot Patterns pattern, that is similar, and my go to dress. I MUST have this one! I love this too. Great for those 36 degrees summer days we've been having. You've made another beautiful dress Megan! Looks great! I hope you and yours have a wonderful Christmas! I'm reading your post chuckling...because I have resisted buying this dress because it's similar to the Inari....but here I am with a Mother's Day coupon and can't resist any longer :-) But I'm unsure about what size to buy. I made The Blaire Dress in size 6 but hips really needed it in size 8. But looking at this size chart looks like I need a size 10...decisions decisions. You look fantastic in this!